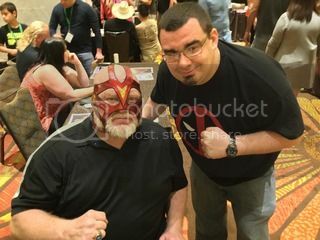 Went to WrestleCon and Met over 120 Wrestlers (List/Details/Photos) – Scotts Blog of Doom! 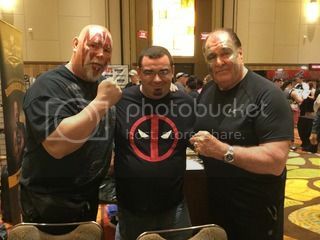 For those of you who aren’t familiar, WrestleCon is kind of like Axxess on a budget with everyone running their own booth. The key differences though are you have a TON of indy wrestlers, plus dozens of legends. You pay a flat rate to get in ($33) and then each autograph and picture you want is an additional charge. For the sake of finances, I only paid for a handful of pictures. Some of these are people I’ve been wanting to meet for as long as I can remember so these are a pretty big deal for me. 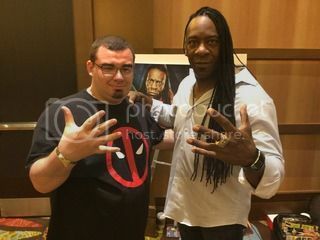 Some of the biggest hands I’ve ever seen, and I have some big ones myself. Every bit as intimidating as you would expect. I said they were one of my favorites when I was a kid. Ax: “WHAT DO YOU MEAN WERE? WE BETTER STILL BE!” He smiled after. Probably the nicest guy I met. Very friendly and talked for probably a good three minutes about baseball, my hometown being an old stop for him and UK basketball. I even got to wear the crown. Lawler is every bit as friendly and quick witted as he comes off on TV and he was a blast to talk to. On a random note, Lawler was doing a podcast later that day with Cleveland Indians closer Chris Perez, who was there with him. I’m a lifelong Indians fan so this was a major bonus. This was overcoming a childhood fear. Vader beat Sting. No one could beat Sting! The camera doesn’t do her justice. I know she was hot when she was wrestling but my goodness she’s aged very well. Absolutely stunning and one of those people who kinds of oozes sexiness if that makes sense. On a side note, her handler was a horrible jerk. Lita was signing and the line was a bit long so I asked how long she would be signing. He glares at me and says he doesn’t know (that’s a pretty important thing to be missing). Then when I was paying, he literally snatched the money out of my hand. None of the others were like that all day so it’s not like it can’t be done. That would be Brooke Tessmacher, Kelly Kelly, Christy Hemme and Candace Michelle. Kelly has some of the most hypnotizing eyes you’ll ever see and again, the camera does not do her justice. The other three are gorgeous but Kelly was just on another level. My all time favorite midcarder and, before New Day, the original Kofi Kingston. Very nice guy. And I probably forgot a bunch that I didn’t write down. That’s 120 wrestlers in four hours. 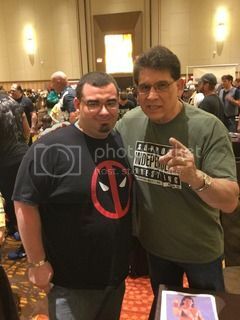 By comparison, I’ve been to 4 Axxess sessions and might have met 20 people. The names might not be as huge (Ric Flair, Sting, Edge and Christian were at this show too) and the memorabilia might not be there but there are major, major names to meet at a reasonable price. Check this out if you go to Wrestlemania in the future. I’ll be going every single time as it’s a total blast. Bryan/Reigns and two World titles?